The Black Bear Review boasts about accepting work in all four literary genres, but what does that mean? In simplest terms, genres are used to organize, categorize, and classify literature. 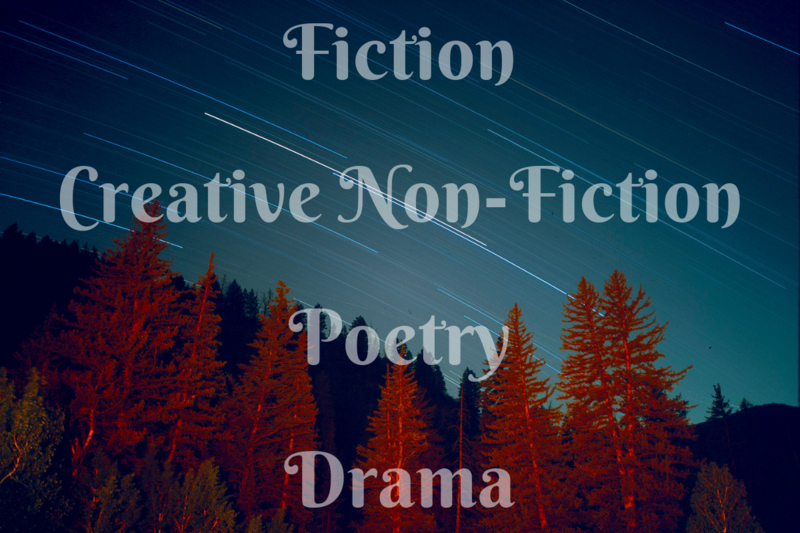 The four primary genres of creative writing are fiction, creative non-fiction, poetry, and drama. Fiction: The fiction genre includes all works conceived primarily out of the writer’s imagination. Although fiction may include some elements of reality (names of real-life towns or natural phenomena), it relies on make-believe events to drive plots that often parallel, rather than recite, real-life circumstances. Some examples of fiction form are the novel, short story, or novella. Creative Non-Fiction: Writers of creative non-fiction develop stories based on true to life events but often infuse their own personal views and experiences in their work. Creative non-fiction pieces go beyond fact to appeal to readers through story, experience, and imagery. Some examples of creative non-fiction forms are personal essays, book reviews, memoirs, interviews, and cultural criticisms. Poetry: Poetry includes writing meant to be heard out loud as well as read on the page. Although poetry can take many forms, its foundation is built on a balance of rhythm, imagery, metaphor, and other techniques used to communicate abstract ideas to readers. Poems may be structured (haikus, and sonnets), unstructured (free verse), or even appear to read as a narrative (prose poems). Drama: The genre of drama can include both the fictitious and the fact. In a drama, the story is primarily conveyed through dialogue between characters. It may reference sound and movement, but much is left to reader’s imaginations. Drama includes movie scripts, ten-minute plays, screenplays, and written stage productions. *Much of the information in this article has been taken from “Imaginative Writing: The Elements of Craft” by Janet Burroway and “Write Moves” by Nancy Pagh. We recommend looking into these books for yourself. They’re excellent resources to add to any writer’s toolbox!